The Read Conmigo campaign was created out of the discovery by Infinity Auto Insurance that their primary customers, Hispanic parents, grandparents and caregivers who do not read fluently yet in English are hesitant to read to their children at home in Spanish. Language development studies show that when young children have more exposure to all languages at an early age, they are able to demonstrate higher levels of cognitive flexibility, or the ability to change responses based on environment and circumstances. Read Conmigo books feature creative, fresh and engaging stories in both English and Spanish, so that Hispanic parents and children can read aloud together. Parents of children in grades K through 5 can register online to receive free bilingual children's books at www.readconmigo.org. The program is also utilized by more than 30,000 educators nationwide. The campaign promotes the distinct educational, social, and financial benefits of bilingualism and provides parents with free tools and resources to help them create a lifelong love of reading. In May, 2014, we created the inaugural Bilingual Literacy Month, which is dedicated to raising awareness about the importance of developing bilingual reading skills for Hispanic children and families. The goal of the campaign is to raise awareness of the Read Conmigo brand to the Hispanic market. The Conroy Martinez Group targeted Hispanic families, through an integrated PR, marketing and social media campaign by using media relations, marketing and special events involving partnership organizations. By leveraging Read Conmigo’s participation and partnership at 128 community events over the last year, they were able to further their educational outreach. CMG distributed a press release announcing Read Conmigo Bilingual Literacy Month, featuring an official endorsement from Dr. Santiago Wood, the president of the National Association for Bilingual Education. CMG also staged and publicized the following local events and contests to promote Bilingual Literacy Month: story time sessions for children at two popular local retail shopping centers; story time session at a Miami area elementary school featuring Miami Marlins catcher and World Series Champion Jarrod Saltalamacchia; bilingual Literacy Month’s “Tell Us Your Story” essay contest in partnership with The Miami Herald; a chance to win a Kindle Fire HD when registering for a Read Conmigo subscription online during Bilingual Literacy Month; and opportunities to share photos and stories on social media via the hashtag, “#BilingualLiteracyMonth.” CMG also obtained an official proclamation from the Miami-Dade County Public School Board declaring May as “Bilingual Literacy Month!” The agency also submitted a Letter to the Editor on behalf of the Infinity Auto Insurance CEO regarding the importance of raising awareness during Bilingual Literacy Month. Following the campaign, Read Conmigo garnered 2,100 NEW registrations in the month of May alone, which was a 50 percent increase over the same timeframe in 2013. The program saw a spike in their website traffic, including: number of sessions doubled compared to 2013, number of users (new and returning visitors combined) increased by 96.85%, number of page views went up 89.03 percent. More than 141,000 Miami Herald readers were exposed to Read Conmigo and Bilingual Literacy Month following the publication of the Letter to the Editor. More than 4,000 visitors at Westland Mall and 2,000 visitors to Southland Mall in Miami were exposed to Read Conmigo and Bilingual Literacy Month following Storytime Sessions at both venues. 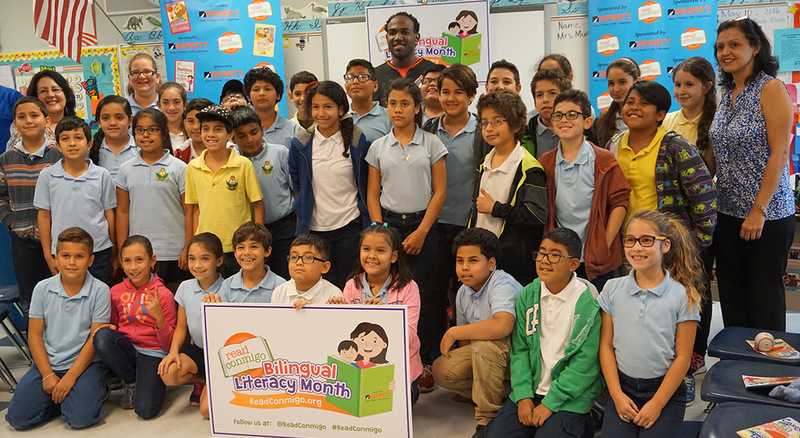 Through the partnership with the Miami Marlins, Read Conmigo reached more than 6,000 fans at a Miami Marlins game who watched a video on the Jumbotron regarding Read Conmigo Bilingual Literacy Month and the reading event featuring Jarrod Saltalamacchia.